Sometimes, you just need to hole up in your space and get down to the business of making some heart-warming foods. This weekend was very much like that for me, and I am hoping to get a whole series of posts out about the things I made in the next couple of days. One thing I have started making in the last few years, for the very first time in my life, is yeast breads. Granted, with the low-carb frenzy of the last decade, I generally shy away from white flour, but there are some times when you just want good old-fashioned bread. I figure that, as long as I am making it, and I have a reasonable idea of where the ingredients are from, it is better than eating processed white bread or even bread from the grocery store bakery. In spite of the fact that I think that Martha Stewart’s recipes are written in a way that sets you up for failure, I like the ideas she presents in her Baking Handbook. * It is a decidedly complicated, unusable book, but find it inspiring. 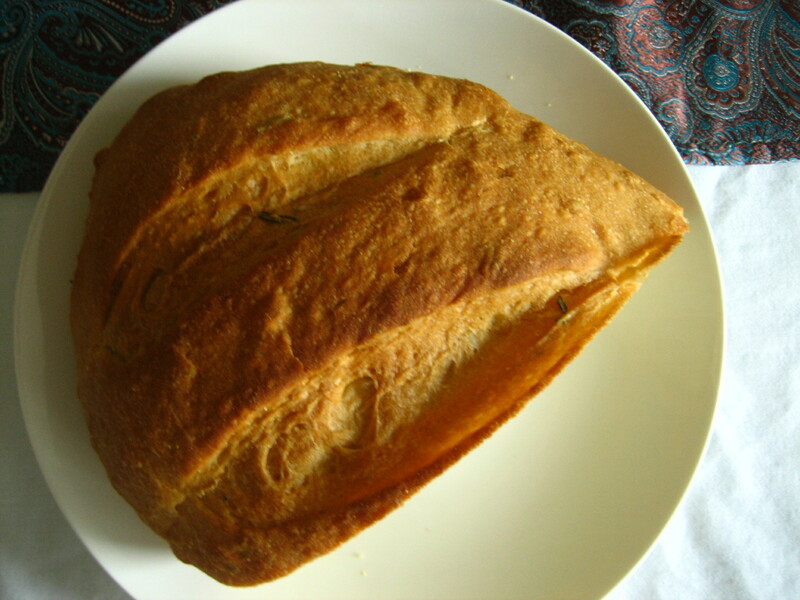 Most recently, I made her Olive Oil Bread and, after many adjustments on flour, came out with a very delicious, beautiful product. 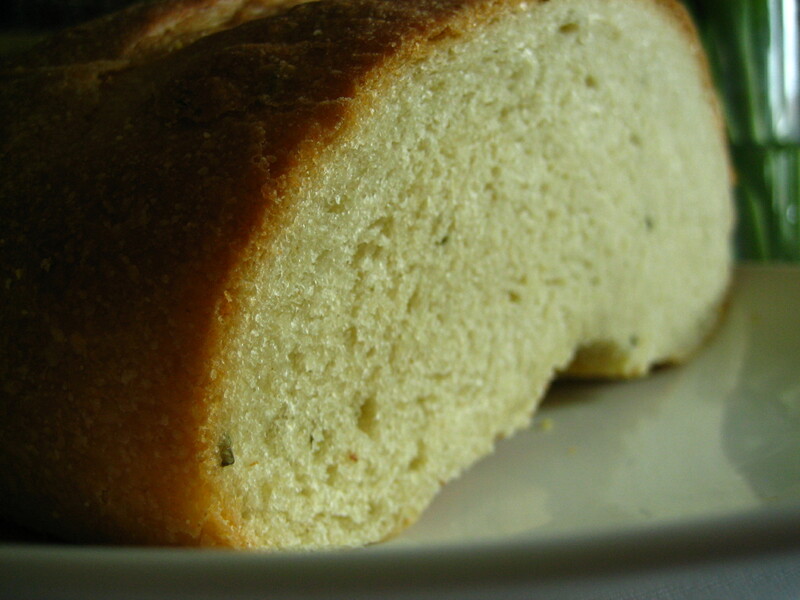 When I am making bread, I figure that I should try to make it somehow special, so in this case, I used some very good olive oil and added a healthy tablespoon of chopped fresh rosemary. Something about the texture of this bread, along with the herbal notes of the rosemary, made it so satisfying and delicious. Arguably, any bread that comes from your own oven is satisfying. I encourage you to make a batch soon, and do it with your hands. Appliances like bread makers and electric mixers with dough hooks make the process easier, but save that for when you have already mastered making bread with your hands. When you have a tactile understanding of the dough, there is a strange comfort you gain from making and eating it. It is worth the effort. *If anyone has a suggestion for a good, uncomplicated bread book, I would greatly appreciate it. Also, feel free to commiserate here regarding the failures you may have encountered when trusting Ms. Stewart to guide you through the creation of any dish. Hi fignatius I love making bread but never seem to be able to do it before my wife steps in & I can,t persuade her to experiment with different recipes. We do use a bread machine because we only have 1 of these combination ovens which are hopeless for controlling the temp. If you don,t mind me asking would you share your olive & rosemary recipe? My favorite bread book is The Handmade Loaf, by Dan Lepard. if you enjoy making bread without the aid of any mixer, bread machine, you will fall in love with this book. Most recipes involve a sourdough starter, but he explains very well how to make it – it simply changed my approach to bread, and I improved so much after mastering his method of minimal kneading. Thanks so much for the book suggestion! I plan to pick it up soon! Great to meet you, and I love your blog – we foodie bloggers have to stick together, I think! Hey, we found this here when i did a quick google search. Nice post you got here! Keep it up!